Charles Bunnell: Rocky Mountain Modern recently opened at the FAC. 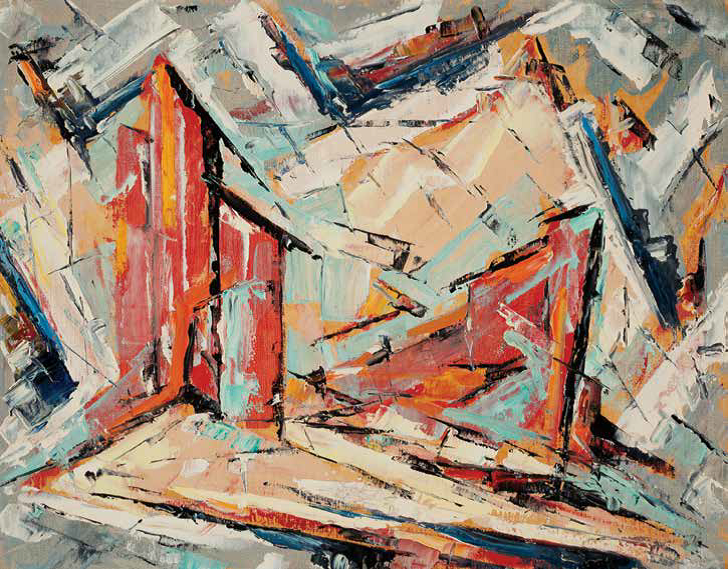 Bunnell's abstract expressionism stood out among the strong community of local artists who studied together at the Broadmoor Arts Academy. Two of our interns spent the morning with 96-year-old artist Eric Bransby at his home and studio in Colorado Springs. Bransby, a muralist and figure painter, spoke about the ambiance of the early abstraction movement in Colorado and his impressions of Bunnell as an artist. 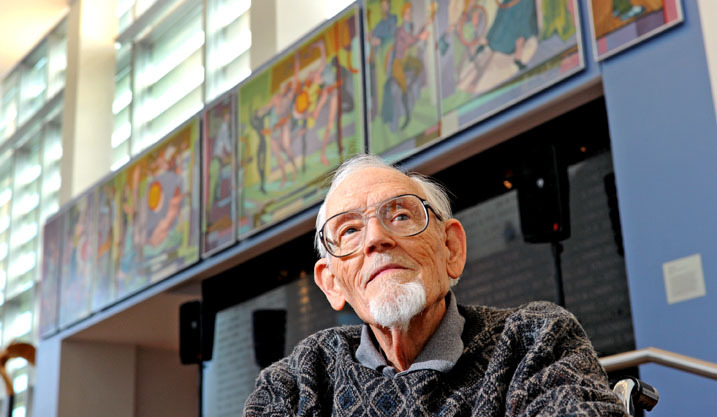 "We got introduced to him, and we were impressed that he was kind of a wild man, going off in 60 directions at once," said Bransby, "We felt that he was different, as so many of the painters were here." Eric Bransby poses in front of his mural at the FAC. Bransby and Bunnell were both students of Boardman Robinson at the Broadmoor Arts Academy. "He was a very interesting man," said Bransby of Bunnell. "He was ahead of almost anybody in this area as far as the coming abstract movement on the horizon, so I think we get that from Charlie, in particular in the beginning, is a blending of representational and abstract, and that you can quantify and qualify." Charles Bunnell, Garden of the Gods and Pikes Peak, 1941. Watercolor on paper. Collection of James and Virginia Moffett. 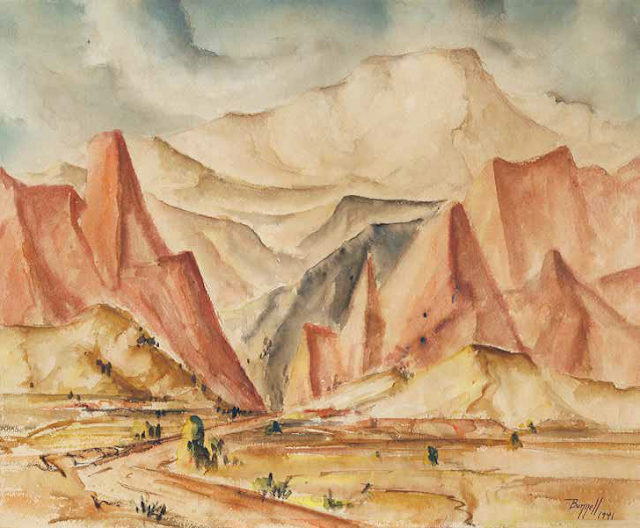 Bransby explained that most artists in the 1950s incorporated the Colorado landscape into their work in one way or another. "The landscape over here is so superhuman," Bransby said, "The area was surrounded by these colossal hunks of stone, and whether you are painting landscapes or not that had an effect." Charles Bunnell, Mines and Mountains,1951. Oil on board. Collection of the Kirkland Museum of Fine & Decorative Art. In the paintings, drawings, prints, and archival materials on display in the exhibition, pure color and shape are the elements through which our ultimate response is sensory, emotional, and intuitive. "The environment here was a little bit mystical. It was very romantic, and Charlie reacted to that full force."